Description of "Guru Opinion :- You Have a Right to Make Mistake"
Guru Opinion: is to help you in taking charge of your own life, a product from the experience of two soul travellers meeting accidentally and exchanges their experience while travelling and meeting people. While travelling across meeting different people, cultures and experiencing nature, putting an honest effort to examine multi factorial aspect of human’s basic nature & reaction. 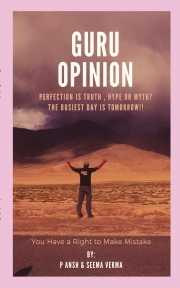 Reviews of "Guru Opinion :- You Have a Right to Make Mistake"